Dr. Dan Ben-Canaan is perhaps the world’s foremost authority on the history of the Jews of Harbin. In 2009, while at the Heilongjiang University of Western Studies, he authored a book entitled “The Jewish People and Their Place in History – The Jews of China and Harbin”. Along with his wife, Dr. Ben-Canaan established the Harbin Jewish Culture Association in late 2014. The Sino-Israel Research and Study Center is now under the umbrella of the Harbin Jewish Culture Association. After 14 years of lecturing at Heilongjiang University, Dr. Ben-Canaan moved to Northeast Forestry University, one of China’s top science institutions, where he teaches postgraduates, PhD candidates and faculty the methodologies of research and academic writing. Read about the talks as reported in the Jewish Times Asia. Considering the modest size of the community, the Calcutta Jews left a sizeable footprint. There are three impressive and large synagogues, two schools, and a cemetery. 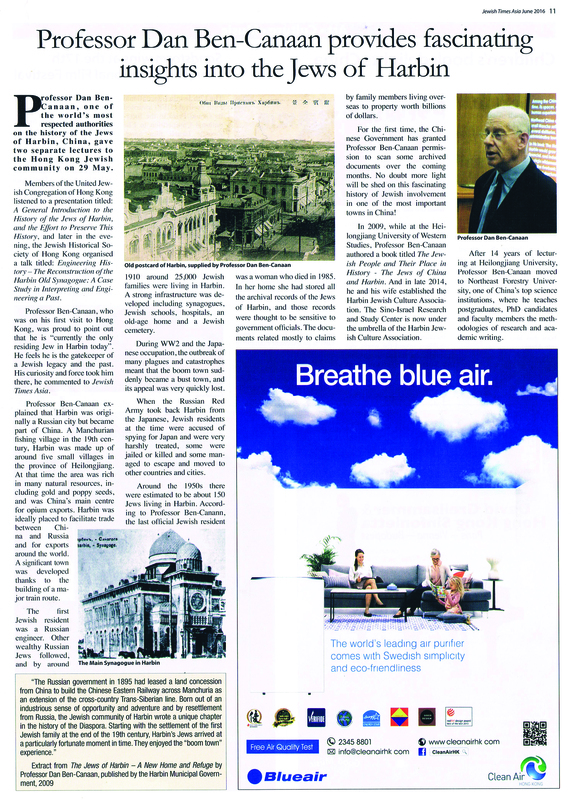 Ezra Mansions and the Ezra hospital, the iconic Nahoum’s Confectionary, and two buildings in the zoo that were endowed by Jews still bear Jewish names. There is the Belilios Street, Ezra Street and Synagogue Street. Many other mansions, residences and office buildings still stand though they no longer bear their Jewish names. Today, there are barely thirty Jews left in the community, most being very elderly. This exhibition was presented by Yael Silliman, who is undertaking an oral history project to record the impressions and knowledge of those people who were familiar with Jews in Calcutta. To access these oral histories, she is working with a cross-section of communities in Calcutta including Armenians, Christians, Muslims, and Hindus who were closely connected to the Jewish community. These oral histories will provide the basis for writing a paper that Ms. Silliman will submit to academic journals and use to enrich the digital archive she has developed entitled Recalling Jewish Calcutta. Listen to Phil Whelan talk with Jael Silliman about the Jews of Calcutta on RTHK Radio 3’s Morning Brew. Dr. Glenn Frommer presented the story of the restoration of the Ohel Leah synagogue in 1997, with previously unpublished photographs. Local historian Jason Wordie took a group of 30 members of the JHS on a walking tour of Hong Kong’s Western district. A group of 20 members visited India for a week, spending Shabbat with the Jewish Community in Mumbai, and visiting the community in Cochin. Jennifer Roth, Senior VP and Head of the Judaica department at Sotheby’s New York, spoke about the collection, which illuminates the sweep of Jewish history from the medieval world to the present. Paul French, who participated in the recent Hong Kong International Literary Festival, presented his novel “Midnight in Old Peking”. While researching for this book, French came across some interesting stories, quite unrelated to his subject, which he felt deserved to be told. Why are the Chinese so interested in the Jews? Professor Xu Xin, director of the Centre for Jewish Studies at Nanjing University, spoke about this subject that is both interesting and curious. The JHS organised its first overseas trip to Harbin in mainland China. The Hong Kong Heritage Project, established by Sir Michael Kadoorie, together with the JHS, presented a rare opportunity to delve into the rich history of Jewish life in Shanghai and Hong Kong during and immediately after World War Two. Through the use of unique and recently discovered records, oral histories, photos and film, history came alive for this original exhibition that celebrates the courage, forbearance and determination of a small group of people swept up in the turmoil of a changing world. 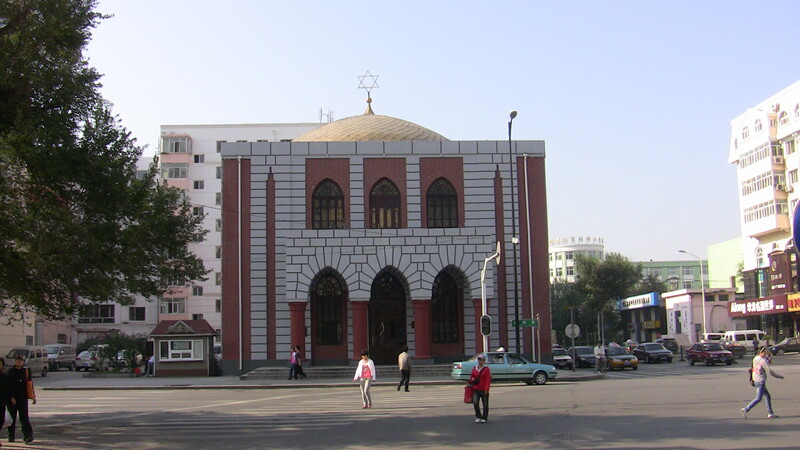 Dr. Maisie Meyer traced the history of a community of Jews, mainly from Persia and Yemen, who arrived in China in the 12th century with the great caravans of the ancient Silk Road and settled in Kaifeng, the capital of the Northern Sung Dynasty. At its peak, there were about 1,600 Jews who made up the vibrant, thriving orthodox Sephardi community but, over time they became isolated from other centres of Judaism and gradually integrated into Chinese society. By the early 17th century, except for their religion, they had become indistinguishable from the Chinese population. Abject poverty, the death of their rabbi and the destruction of their synagogue in a great flood reduced them to selling their Torah scrolls and religious artifacts in the early 19th century. Dr Meyer, will poignantly describe how, in the early 1900s the Shanghai Jewish Community endeavoured to bring the remnant of these Kaifeng Jews back to the religion of their forefathers. Dr. Meyer has lectured widely on Baghdadi Jews in the eastern Diaspora and has presented papers on the subject worldwide. She has published numerous authoritative articles in prestigious journals and her book, From the Rivers of Babylon to the Whangpoo: A Century of Sephardi Jewish Life in Shanghai is into its second printing. Book reviews have heralded it as the definitive history of the Baghdadi Jewish merchants who settled in Shanghai in the mid-19th century. The JHS hit the road (so to speak) with a general interest historical walking tour of Happy Valley and Wanchai, jointly led by our vice-chairman and historian, S. J. Chan, and well known local historian, Tim Ko. Dr. Maisie Meyer discussed how a small number of adventurous Baghdadi Jewish merchants began settling in Shanghai in the mid-19th century and organised a vibrant community that maintained itself with distinction for a century. Her exciting journey described how, in this faraway outpost of the Jewish diaspora where the community never numbered more than a thousand people, the Baghdadis accomplished a great deal. Dr. Meyer also discussed how the humanitarian efforts of the Shanghai Baghdadi Jews in accommodating some 20,000 victims of Nazi persecution reflected further credit on this remarkable community. She touched upon the Japanese occupation of Shanghai during World War II and the city’s subsequent incorporation into the Peoples’ Republic of China and how the Jews felt pressured to leave the country and scatter across the globe.